For the third year in a row, Science Center staff took note of the leaves. The study is a simple one, but with great potential interest for the future. The goal is to determine whether or not the trees in our area are leafing out earlier than usual – “usual” the word to be determined first, of course. Our data shows that in a typical year, leaves are nearly fully formed by May 15, but definitely so by July 15; this year, the leaves were late in developing. If they leaf out much earlier than usual, we can represent global climate change in our data. On May 16, 2016 (53 degrees, clear and sunny, we completed the 100 measurements needed for the first phase of the survey. On July 18, 2016 (83 degrees, clear and sunny), we repeated the measurements on the remaining leaves. Of the 50 leaves that were selected for the start of the survey, 23 were either partially or fully destroyed in time for the second survey, 8 from the beech, 15 from the maple. The second set of measurements took place after a historic outbreak of gypsy moth caterpillars. The average length of the leaves of the American Beech was 90.76mm in May and 128.59mm in July. The average width of the leaves of the American Beech was 41.65mm in May and 61.65mm in July. On average, the leaves on the American Beech grew in width by 32% over the two-month period, while the length grew by 29%. The average length of the leaves of the Red Maple was 87mm in May and 97mm in July. The average width of the leaves of the Red Maple was 111.60mm in May and 124.20mm in July. On average, the leaves on the Red Maple grew in both width and length by 10% over the two-month period. This study is meant to be conducted over a period of decades, so there is little to be told in a single year’s results. Climatic conditions have obviously affected the rates of growth of the two trees. 2014 proved to be a “normal” spring. The spring pf 2015 was marked by heavy snow cover that remained in place into April, yet the leaves by mid-May were fully leafed out, with both trees showing minimal growth between then and July. In 2016, a long, lingering, cold and dry winter stayed the leafing out of the trees; by mid-May, the leaves on the beech tree were only approximately 70% of what they would be, and the leaves of the maple had only reached 90% of their eventual size. The 2016 data set, too, is marred by the loss of 46% of the leaves from the first survey to the second. 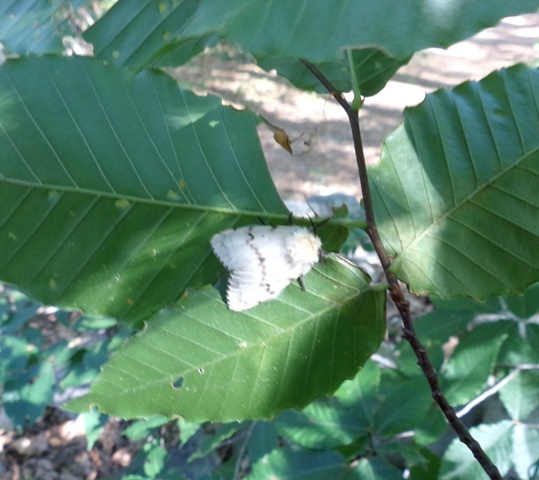 Gypsy moth caterpillars, which benefitted from the long, dry period leading into the survey, exploded in population, heavily damaging many trees in the process, including the two in this survey. By comparison, in 2014, only 3 leaves were lost between the first and second surveys; in 2015, 9 were lost; in 2016, 23. Despite this fact, and a lack of rainfall during a long, hot summer, the 27 leaves that did make it to the second survey showed relatively uniform growth to reach average sizes comparable to the previous two years. Ironically, this study is intended to prove that the leafing out of trees is happening earlier than historically phenologically recorded due to global climate change. Until this date, the study has shown that the trees are almost fully leafed out by May 15, when warblers arrive. This year’s study showed a delayed, rather than early kickstarted leafing out process. This annual variation may prove to be an anomaly; then again, maybe not. The next SSNSC Leaf Measurement Survey will commence around May 15, 2017.